Simpson has released several CDs including For Alderney on the and/OAR label in 2004, Sonic Bathing 1 on Farfield Records the same year, and A Meditation For Spring on Autumn Records in 2005. His work The Valley Of Crows appeared on the 2006 compilation Recorded In The Field By… on the German label Gruenrekorder. His pieces were selected for inclusion in sound art compilations curated by Colin Fellows of the John Moores Liverpool University (Hope, Trace and Zero), and two pieces have been released through Time Recording’s EMIT series, Abha (EMIT 2296) and Waterpump (EMIT 1197). 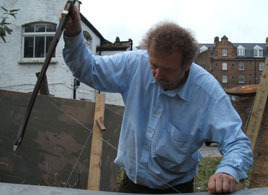 Simpson’s work was included in the ‘Music for Spaces’ composition series on BBC Radio 3, and has been frequently featured on London’s art radio station Resonance 104.4 FM.